The Omega VRT350 is now available in Black and grey finish. Includes the latest fine hole strainer made of Ultem material. This Omega VERT juicer will allow you to create delicious fruit and vegetable drinks in a short amount of time, without stripping valuable nutrients. I'll confess this is the first juicer that I've ever owned, so I can't compare to other juicers, but this juicer is proving to be excellent for me. I did a lot of research and I was looking for a quiet juicer that had a small footprint and was kind to the freshies�delivering an enzyme packed juice. 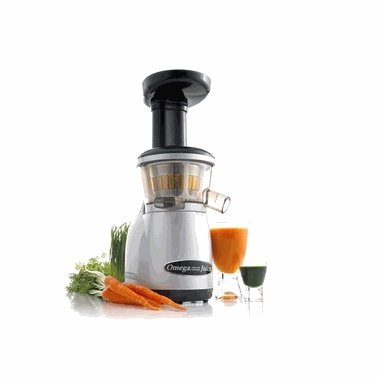 This Omega juicer delivers on both counts. Was so anxious to receive my new juicer. Would not recommend the product for difficulty to use, lots of clean up. This is coming from an experienced juicer.. Since it is quite an investment, I did a lot of research before purchasing my first juicer. I wanted to make sure I could find one that was easy to use and clean, and created dry pulp (maximizing juice content). After weeks I decided on the Omega VERT and found Harvest Essentials provided the best price for this juicer. It is bulky so I leave it on my counter, which is fine because I use it often. I do recommend breaking up the leafy greens quite a bit, as they do get caught up and clog the spout. The pulp is so dry when it comes out. I like to reuse the pulp in baked goods for some added fiber and texture. This juicer is amazing. It offers the slow, masticating function to ensure the juice isn't heated up and it really is good at extracting the juice. It's identical to the similar Hurom model, but replacement parts do run cheaper. We haven't had to replace any of ours and it's durable as can be. If you get into the juicing habit, this is a really great juicer. Depending on your product used, it can take time to clean, but even that's not bad. It comes with the territory.